U.S. Rep. Robin Kelly was backed by t he Rev. Michael Pfleger and Mayor Rahm Emanuel in her call for new gun laws. THE LOOP — A new congressional report on gun violence calls for nationwide background checks on gun sales, repealing legal immunity for gun manufacturers and allowing judges to take guns away from those deemed a danger to themselves or others. "The report is not anti-gun," said U.S. Rep. Robin Kelly (D-Matteson), who led the way in preparing and releasing the 2014 Report on Gun Violence in America. "It's pro-common-sense." In a news conference at the Dirksen Federal Courthouse Monday morning, Kelly called the congressional report a "call to action" and a "blueprint for ending the crisis" on gun violence in Chicago and nationwide. Colleen Daley, of the Illinois Coalition to End Handgun Violence, called it "one of the most comprehensive blueprints for gun violence prevention I have ever seen." Ronald Holt, father of a 16-year-old son killed in a CTA bus shooting in 2007, said universal background checks for those seeking to buy guns are "critical." The report recommends background checks for gun purchases, "firearm restraining orders" allowing courts to take guns away from those deemed a danger to themselves or others, so-called smart-gun technology to trace stolen guns and the repeal of legal immunity for gun manufacturers. It calls gun violence "a uniquely American phenomenon" and estimates that 1 million U.S. citizens have died from gunshot wounds in murders, suicides and accidents over the last three decades, "more than the sum total of combat deaths in all the wars in U.S. history." The report specifically focuses on "gun violence among school-age youth in Chicago," and supports local initiatives such as after-school tutoring and summer jobs programs as attempts to reduce gun violence. "Chicago is not an island," Mayor Rahm Emanuel said. "It needs a level playing field." He backed Kelly's call for federal gun legislation to keep guns from coming to Chicago from other states like Indiana and Mississippi and called existing gun laws "the weak link in the system." 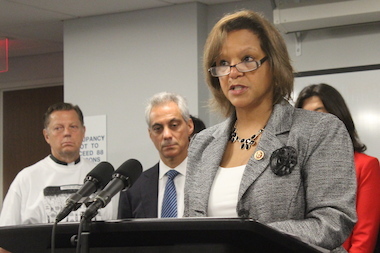 Without national gun laws, Daley said, "It's tough to crack down on bad-apple dealers who continually supply illegal guns to gangbangers and dangerously mentally ill individuals and others who commit crimes in our communities again and again and again." "Our goal is to re-energize the gun-reform debate and put the safety of Americans at the top of Congress' agenda," Kelly added. Kelly said she is not dissuaded by the National Rife Association's successful lobbying against new gun laws, saying, "Every life lost is a reason to keep fighting" and insisting that the majority of voters and NRA members support background checks. 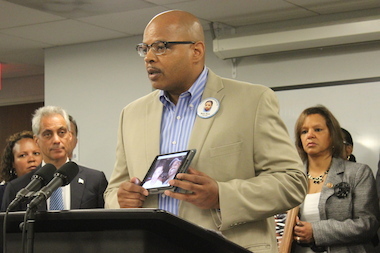 "The universal background checks are critical," said Ronald Holt, a Chicago Police commander whose 16-year-old son, Blair, was killed in a 2007 CTA bus shooting. Pointing out that, on average, 85 U.S. citizens a day are killed by guns, Holt cheered the "public health approach" taken by Kelly's congressional colleague U.S. Rep. Mike Thompson (D-Calif.), chairman of the House Gun Violence Prevention Task Force, who has argued that gun control is really a national health issue and who contributed to the report. The NRA's Institute for Legislative Action has opposed that approach as an "unjustified incursion on Second Amendment rights ... unjustified and expansive in its prohibitions." "It exploits and stigmatizes stereotypes of the mentally ill, most of whom do not pose an elevated risk of harm," the NRA said. The NRA also opposes background checks, insisting they don't affect murder rates and adding, "Straw purchasers are already committing a federal felony. It is hard to imagine that they are going to suddenly start obeying a new law on background checks." Emanuel allowed that "there's a lot of political pressure" coming from the NRA and other gun-rights supporters. "The question is, do you give in to that political pressure, or do you push back with your own sense of political pressure?" he said. Kelly is a freshman member of Congress, but ran a successful campaign last year to replace Jesse Jackson Jr. by focusing on gun control. Kelly explained why she has recently refused to stand for moments of silence for victims of gun violence cited in Congress. "So why don't I stand up with other House members anymore? Because then we sit down — and do nothing. Families of victims don't need more silence. They need for us to stand up and speak out," Kelly said, adding, "We're sick of the moments of silence. We need to do something."